Pretty A line ruffle dress from Spanish brand Babine. Ruffle trimmed bodice with a fabric bow to ..
beautiful layered dress in a pretty coral coloured floral print, from the Spanish brand Babine. O..
beautiful coral coloured dress. Ruffled layers give this puffball dress lots of volume. Pretty fl..
pretty pink dotty print romper from Spanish brand Babine. Ruffle and lace trim bodice. Contras..
pretty pink puffball dress with lace trimmed bodice from Spanish brand Babine. Lace trimmed cappe..
Beautiful pink bubble romper from Spanish brand Babine. Trimmed with pretty pink lace fabr..
pretty pink ruffle trimmed a line dress from Spanish brand Babine. The perfect dress for a warm S..
pretty blue and white ruffle layered dress from Spanish brand Babine. This beautiful d..
Blue striped a line dress from Spanish brand Babine. 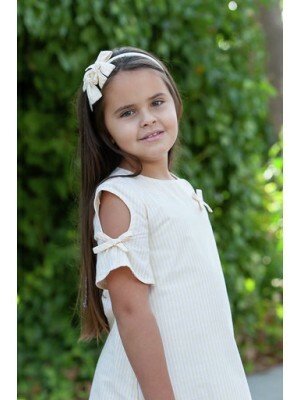 Cold shoulder style sleeves with fabric bow ..
beautiful white and yellow dress from Spanish brand Babine. White drop waisted dress trimmed with..
pretty yellow and white ruffle layered dress from Spanish brand Babine. This beautiful dress is p..
yellow striped a line dress from Spanish brand Babine. Cold shoulder style sleeves with fabric bo..
Tenis jelly shoes from Spanish brand Igor. Perfect for protecting little feet on the beach or aro..